In the early-falling dark, golden leaf-stars drifted down, skittering against the windshield, plastering themselves to the shining blacktop. They blew into shallow drifts against the steps of Memorial Hall as theater-goers hurried out of the chill wind, turning their umbrellas right side out, eager for the warm light. Inside, the mood mixed relief (the storm was not for us, this time) with somber anxiety (this storm is going to hurt a lot of people we know) with anticipation (we are about to hear one of the world’s finest orchestras) and a lashing of potent privilege (we’ll be the first in the U.S. to hear this commission), and the crowd buzzed quietly. We settled early into our seats; the Mariinsky Orchestra into theirs, rank after rank of chairs filling the stage. Silence, all awaiting Maestro Valery Gergiev and the two featured trumpeters for Matthias Pintscher’s Chute d’Etoiles, Part 1. Only the fricative rub of rosin on bow strings disturbed the quiet. We were “gathered together in the name of music,” as Emil Kang of Carolina Performing Arts said in his introduction. Music to drown a hurricane; music to outlast death. Carolina Performing Arts co-commissioned, along with the Schleswig-Holstein Festival, Pintscher’s work as part of its grand investigation of Stravinsky’s The Rite of Spring. The composer (b. Germany 1971) worked with a two-trumpet theme from The Rite, but perhaps more importantly was inspired by German artist Anselm Keifer’s (b. 1945) Chute d’Etoiles. Keifer has often used lead in his paintings/constructions, and its qualities of density, malleability and muted reflectivity are all evident in Pintscher’s music. 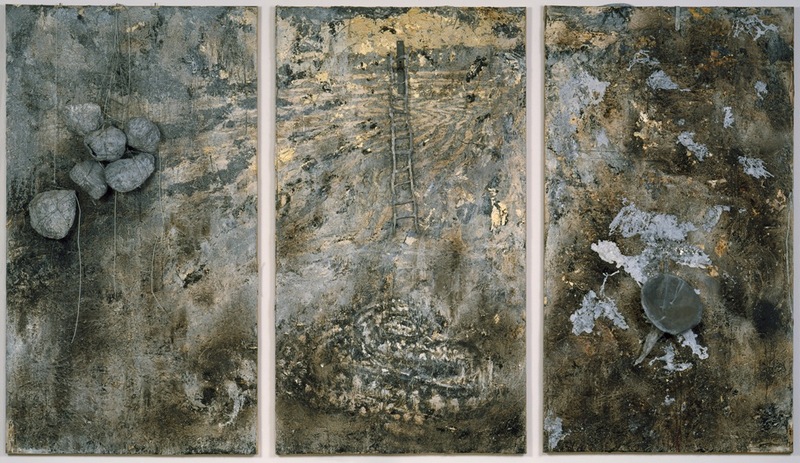 In the permanent collection of the NC Museum of Art: Anselm Kiefer, Untitled, 1980–1986, oil, acrylic, emulsion, shellac, lead, charcoal, and straw on photograph, mounted on canvas; with stones, lead, and steel cable; in three parts: (panel with boulders) 130 1/4 x 73 in., (panel with ladder) 130 5/8 x 72 5/8 in., (panel with funnel) 130 1/4 x 72 7/8 in., Purchased with funds from the State of North Carolina, W. R. Valentiner, and various donors, by exchange. Listening the the 10-minute work, I felt very much as I feel grappling with our Keifer at the North Carolina Museum of Art. Time compresses and expands. Lines shoot toward the viewer, arrowing in, then race away. Velvety murk muffles and confuses. Space opens out. Something resolves itself, but remains a mystery. Traces glow in memory. Now when I see Keifer, I will hear muted trumpets, beckoning, calling up infinite distance. There was more, of course–Shostakovich, and R. Strauss’ Heldenleben, dedicated to the memory of Bill Friday–but it will have to wait. Tonight the splendid orchestra will play the grand mad Rite, and I need to get there. You could eat some of the paintings with a spoon–preferably a silver spoon, or, even better, a silver-gilt spoon. The North Carolina Museum of Art is opening an eye-gratifying exhibition of great paintings and luxe objects this weekend in STILL-LIFE MASTERPIECES: A VISUAL FEAST FROM THE MUSEUM OF FINE ARTS, BOSTON. It will remain on view through Jan. 13, 2013, but don’t wait. You will probably want second helpings. I was going to show you some pictures–including one of the perfect spoon–but my photos have been disallowed. The NCMA’s fine curator John Coffey eschewed a chronological arrangement of the work, which at the press preview he called “often the most boring way you can arrange pictures.” He and the other curators instead looked for “conversations” and “correspondences” between works and across time and geography. “We wanted to declare our eclecticism right up front,” said Coffey, pointing to a 16th century painting of the Vanitas type that opens the show–right next to a Georgia O’Keefe sunflower head in brilliant yellows. The two paintings elucidate still-life painting’s long and wandering road through history, as do many other juxtapositions in the exhibition. Unless it was making a sermon (vanity, all is vanity…death comes in the end), for centuries, still-life just got no respect. Cezanne changed that, and there is one fine Cezanne to look at here, well-positioned next to a glowing Stanton MacDonald-Wright (can’t show you that, either). 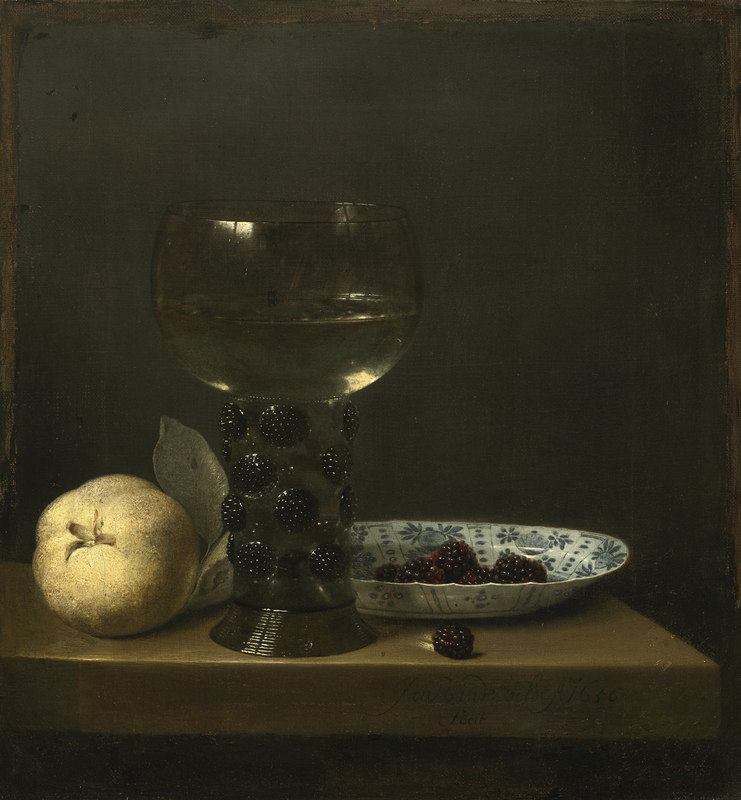 Suddenly still-life was about art–about composition, color, design, geometry. 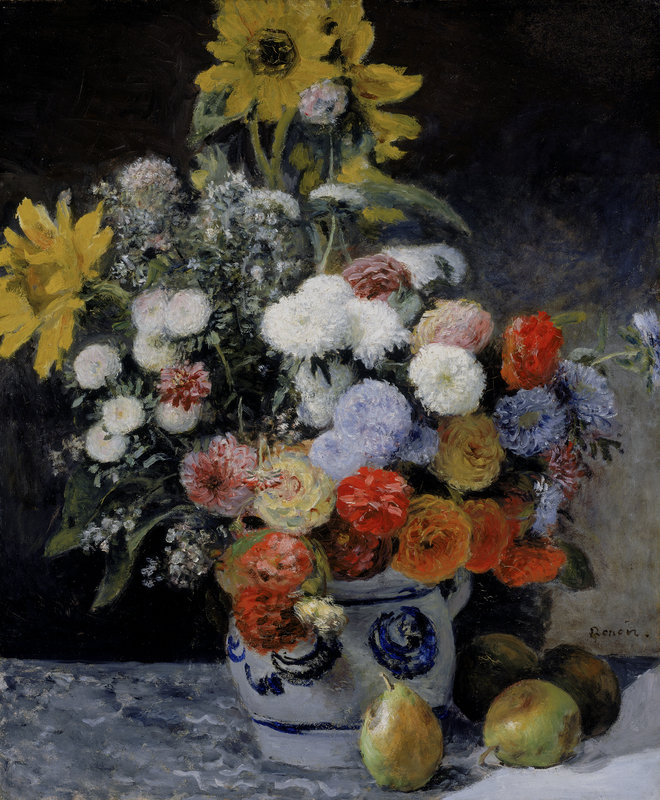 It didn’t have to be pretty–witness the Braque–but sometimes it was not only pretty but downright beautiful, like the wonderful, exuberant Renoir. You can feel the softness of those asters over the leathery zinnias, and what a play of color! The exhibition also includes a remarkable Franz Kline from 1946 that will knock your socks off. I wanted to show you, but you’ll have to go if you want to see his energy not in bold black but in clear oranges and yellows. I loved looking from this to David Bates’ 1993 Magnolia, with its fecund energy and sensuous thick oil paint (look into the central area, and you’ll find the detail I wanted to show you). It is also neat to look at it with a fancy Tiffany silver pitcher in the foreground, its elegant arching handle echoing some of Bates’ curves (yep, had a photo). Some of my personal favorites are two lovely Fantin-Latours, one of peaches, one of roses. If you want to see how a painter works this kind of magic, study these closely (no, I can’t show you those exquisite brush strokes). Look at the peach and its shadow, and the knife beside it; then look across to the video of fruit decomposing. Remarkably similar! 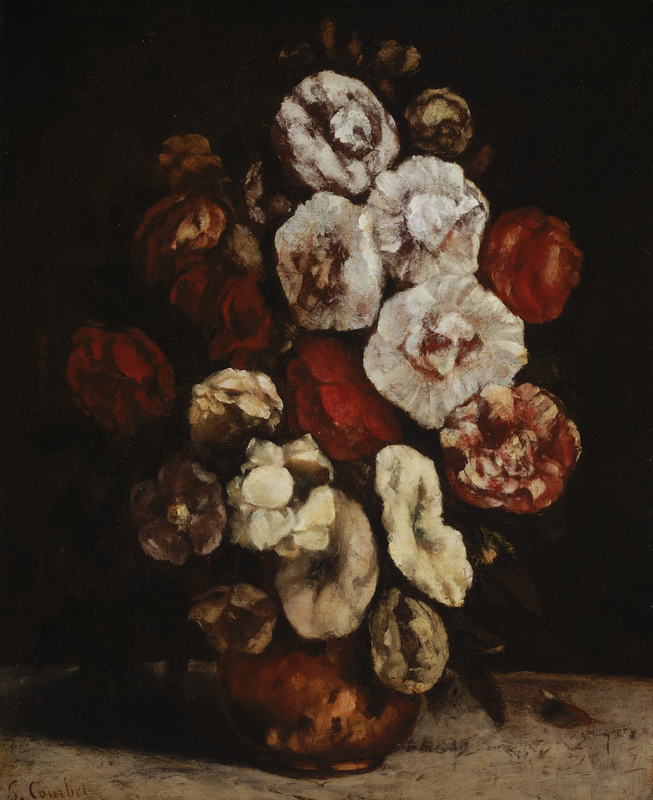 There are no hard edges on Fantin-Latour’s convincing objects. The show winds up with a large William Sharp that curator Coffey called “the still-life equivalent of Albert Bierstadt’s Yosemite,” across from a small picture curator Dennis Weller called “a perfect painting.” He tried to backtrack on that, but his heart wasn’t in it. It is perfect, a little 17th century jewel of careful placement and absorbed observation of light’s interaction with shape and surface. There are valid legal and contractual issues regarding the reproduction of images, even in a review. It is not quite like quoting text. But what a shame. If I saw the luscious bits I was planning to post here, I’d be off to the NCMA like a shot. This is a ticketed exhibition, in the old building; you get a better deal if you buy a double ticket, and take in the really excellent Munch print exhibition at the same time. If you know when you want to go, especially around a holiday, purchasing tickets in advance would be smart. A slim man of unusual grace glides silently through the quiet clusters of art-viewers at the North Carolina Museum of Art, pausing here and there to contemplate the work-in-progress spread through galleries filled with artworks that have achieved their ultimate stasis, a safe repose, where they will be seen in the future, and not forgotten to history. In the pristine white galleries of the NCMA’s luminous West Building, among towering modern and contemporary works, among German Expressionist paintings, among ancient Greek marbles and vases, dancers on seven-foot-square tiles mix bright wet paint with their bodies. They revel in it, moving slick color around with increasing abandon, in shocking proximity to the museum artworks. Shen Wei’s UNDIVIDED DIVIDED at NCMA, 7-17-12. Photo: Grant Halverson, courtesy ADF. In less than an hour the dancers will be gone, and evidence of their performances eliminated, while the still art will remain. The man moves in close to the elegantly twisting and folding bodies, then stands completely still, deeply alert. He’s silhouetted by the theatrical lighting, and his neat dark head, close-fitted white shirt, and wide navy linen trousers cropped mid-calf form a tri-toned triangle in the large composition of the gallery. Blue suede shoes, thick-soled and strong, ground the triangle. It’s Shen Wei–aesthete, thinker, artist, dancemaker, master of visual spectacle–observing the first performance of a new version of his newest work, Undivided Divided, occurring July 17 thanks to a bold collaboration between the NCMA and the American Dance Festival. Early in the 45-minute work, no music plays, but watching Shen Wei watch his dancers and the small horde of guarders and paint-splatter-wipers near them, a song did play in my head: Bob Dylan’s nasal voice singing “All along the watchtower, princes kept the view/While all the women came and went, barefoot servants, too.” Later, an electronic score by So Percussion (an experimental quartet) begins. It is so cannily matched to Shen Wei’s style, that it almost seems as if the music responds to the dancers’ movement, as well as drawing movement out of the dancers. Scaled to fit the NCMA, from the larger version that premiered last winter at New York’s Park Avenue Armory, where Shen Wei had spent a year as artist-in-residence, Undivided Divided goes way past merely breaking the fourth wall beneath the proscenium. Here, the dancers are relatively confined, spatially, but the audience is freed to move among the dancers—or to stand still, as desired. Maker and mark in UNDIVIDED DIVIDED. Photo: Grant Halverson, courtesy of ADF. Spaced like sculptures along the wide passages and galleries of the museum, each dancer remains discrete on his or her tile, like a painting on a wall, or sculpture on a pedestal. The occasional short leap by a dancer from tile to tile seems like the mental leap one makes between artworks. These tile-like dance squares march down the long galleries, culminating with either a large acrylic box with a pool of paint, or a large acrylic construction involving a tray of paint and a ramp down to a tile. From the far side of these, a view extends back along the meridian of dancers. Anyone who has watched any Shen Wei Dance Arts performance knows that these are some of the most wondrous practitioners of the arts of motion and stillness. To be able to stand close to these dancers, to hover over them, to have a slicing arm or whipping foot pass inches from your eye, is an extraordinarily thrilling experience. Even more powerful is the realization that you are within the flow of movement of a Shen Wei dance; your motion, random though it may be, has been provoked by the mind of this artist. Struggling with blocks in UNDIVIDED DIVIDED. Photo: Glenn Halverson, courtesy of ADF. It may be the mind of a genius—the MacArthur Foundation has awarded Shen Wei the famous “genius” grant. At any rate, it is a mind that works at many levels simultaneously. Not only does this piece rearrange artist/audience relations, and highlight the ephemerality of dance art, it expresses of the process of creating any art. More clearly than in any of the other dances in which Shen Wei has explored the idea of dancer as mark-maker, we can see that the dancer makes the marks, and the dancer receives the marks, the drenching color. While making art, the dancer becomes art. It’s a delicious paradox that this occurs in an art museum, because no edifice can preserve this art, which lives only in temporal bodies. Shen Wei’s latest work, at the NC Museum of Art. Photo: Grant Halverson, courtesy of ADF. Undivided Divided repeats twice each evening, July 18-19, at the North Carolina Museum of Art.